Mt. 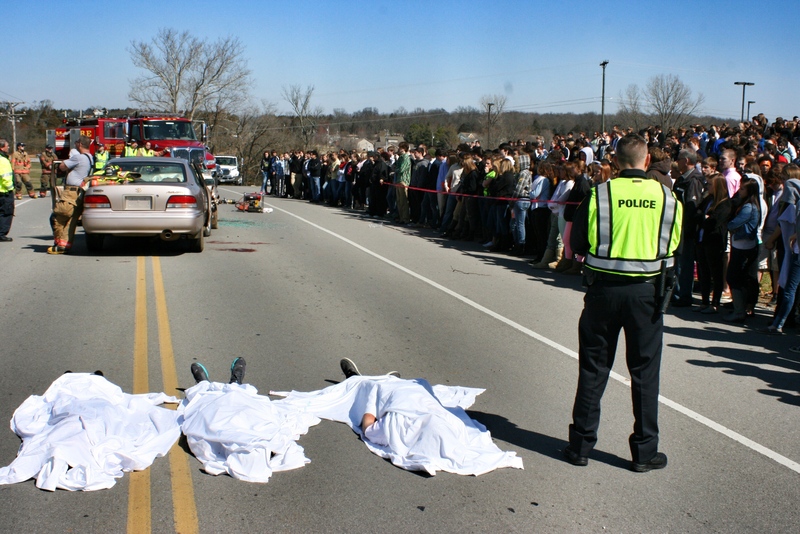 Juliet, Tenn. – A reality-based portrayal of a car crash and the subsequent response by first responders, emergency medical personnel, and law enforcement will take place tomorrow morning at 10:00 a.m. at Mt. Juliet High School. A joint-effort with the school’s EMS classes and Mt. Juliet Police Department will bring the dangers of Teen Drinking to reality, just days before prom on Saturday. The purpose of this exercise is to impress upon students the serious consequences of drinking and driving. The students will receive firsthand experience of exactly what they could be responsible for, including killing someone, possibly one of their friends, as well as being arrested for crimes as serious as vehicular homicide. In addition, the mock crash is also a reminder for parents and guardians to talk to their teens about the consequences of bad driving behavior. In 2013, there were 2,693 traffic crashes in Wilson County, which includes 808 injury, 158 alcohol-related, and 19 fatal crashes. The crash will take place on Golden Bear Gateway, directly in front of Mt. Juliet High School. Therefore, Golden Bear Gateway will be closed between Stonehollow Way and Woodridge Place from 9:30 a.m. to 11:00 a.m. for the exercise. During the simulated response, the public should expect to see emergency vehicles and a medical helicopter in the area of Mt. Juliet High School. Agencies participating in the event are: Mt. Juliet Police Department, Fire Department of Mt. Juliet, Wilson County Emergency Management Agency, and Vanderbilt Lifeflight. Hamblen’s Wrecker Service of Mt. Juliet is providing the crashed vehicles for the exercise. Media is welcome to attend the event and should contact MJPD’s Sgt. Tyler Chandler so accommodations can be made.